I have only learned GLBP on paper, this is the first time I configured it and tried out. 1841-1 shall be the active for vlan 10, 20 and 30. 1841-2 shall be the active for vlan 99, 100 and 101. 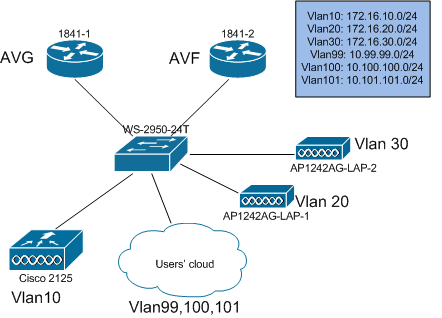 Vlan 99, 100 and 101 are user vlans, I have only configured the vlan 99. It would be better to put a third router, so that one AVG there’s two AVF, one AVF down the other AVF will take over, if a AVG down the other AVF will take over. This entry was posted in High Availability and tagged glbp. Bookmark the permalink.